Series 9 of the relaunched Doctor Who saw the second full season of Peter Capaldi’s 12th Doctor and Clara adventuring across time and space. Given the critical acclaim but mixed reactions to Series 8, all eyes were on Series 9 to establish the new direction of the show. After a couple of years where episodes were mostly self-contained, Series 9 took the bold move of having mostly two-parters, with only episodes nine and ten being classed as stand-alone (and even then, episode ten led into the series finale). This format appears to have been a success, allowing for stronger storytelling and character development over a longer time. 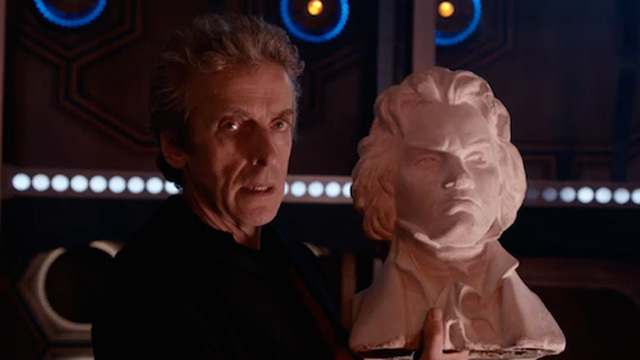 “Who wrote Beethoven’s 5th?” The Doctor contemplates the Bootstrap Paradox. The stand-out performance of the series award must go to Peter Capaldi. Having established a spiky and sarcastic personality for his incarnation in Series 8, this time he gives us a Doctor who has mellowed slightly. He still does not suffer fools, gladly or otherwise, but now he wears the hoodie seen in Last Christmas more often, plays an electric guitar whilst alone in the TARDIS and can even instigate a hug, in moderation. 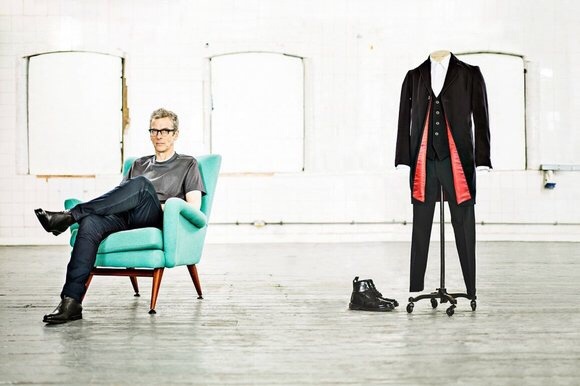 Some have said that in Series 8 he was playing the Doctor, while in Series 9 he was being the Doctor, but I would argue that the Doctor we see from The Magician’s Apprentice onwards is a man more at peace with himself and Capaldi’s portrayal is reflecting this as he has settled comfortably into the role. “And tonight I’m going to party like its 1138!” Oh come on, it 861 years that will be funny! 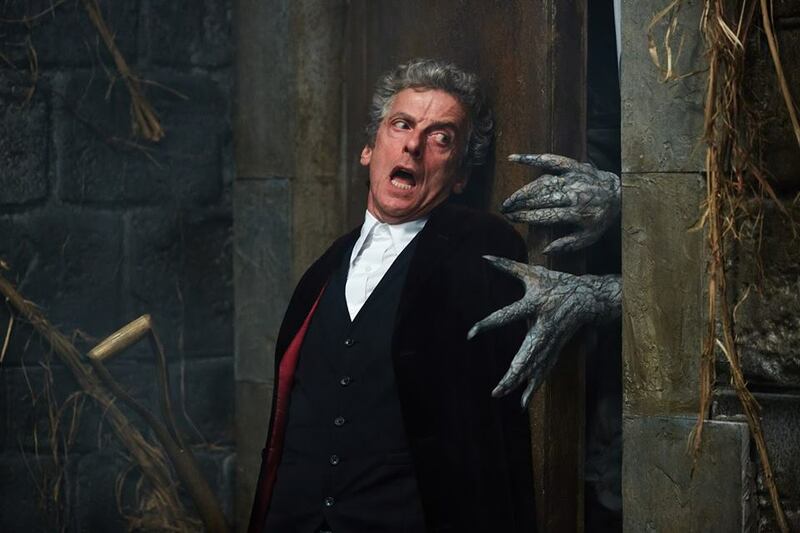 He is also given the interesting challenge of a one-handed episode in Heaven Sent, the first half of the finale. Here the Doctor is alone after the events of Face the Raven, having been transported to a mysterious fortification surrounded by sea and haunted by a creature from his own past in the silent Veil. Handled by a lesser actor this could have just been the Doctor talking to himself for almost an hour, but Capaldi puts in a superb performance here in this unusual setting and rises to the challenge with aplomb. 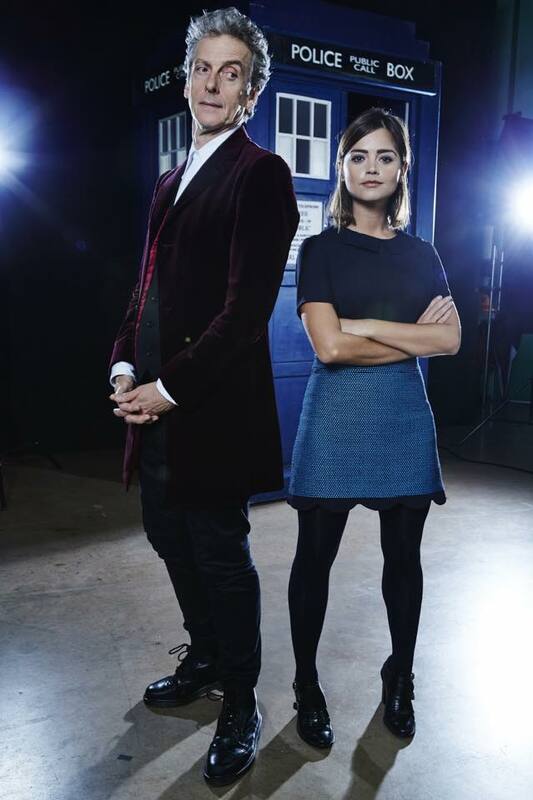 The Doctor and Clara. Friends reunited. Jenna Coleman’s Clara Oswald had been through two major storylines in Series 7 and 8 respectively (The Impossible Girl and the Danny Pink romance) so the focus shifted away slightly from her this time, and more onto the relationship between the Doctor and Clara. We saw a more reckless Clara in Series 9, taking chances in the firm knowledge that the Doctor would always find a way to save her. On a couple of occasions he mentions having a “duty of care” towards her but she still rushed headlong into trouble, until it finally caught up with her in Trap Street on 21st century Earth, when she took on the death sentence imposed on old friend Rigsy (Jovian Wade) and the Doctor was unable to save her. Well, until he returned to Gallifrey and broke the rules in Hell Bent anyway. 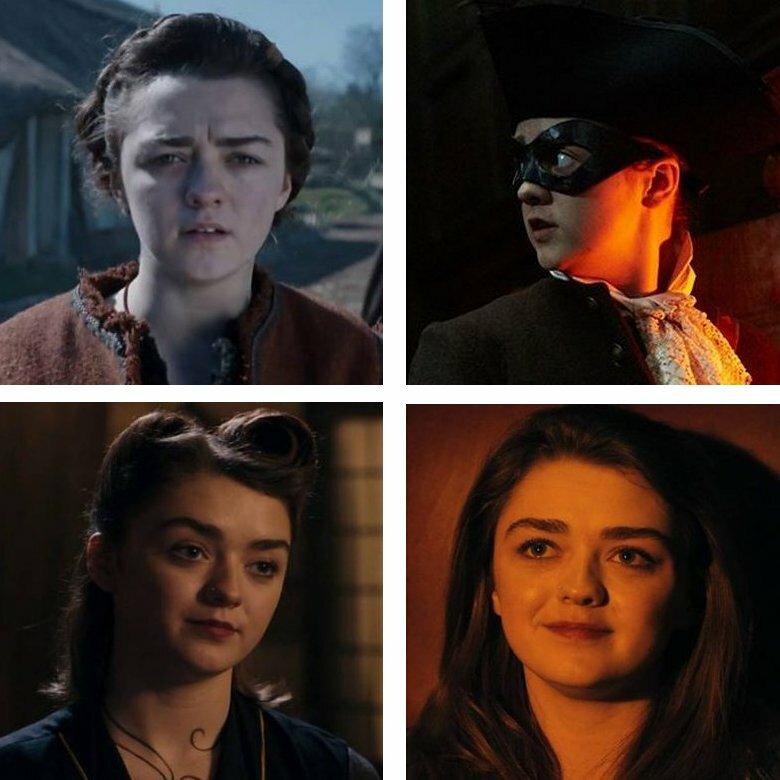 Of the many guest stars with major roles in Series 9 the one that made the most impact was Maisie Williams as Viking girl Ashildr. Making her debut in the fifth episode as the titular Girl Who Died, she was made immortal by the Doctor in an effort to save her life. The following story, The Woman Who Lived, showed the Time Lord and his TV audience the consequences of his actions, with Ashildr having become hardened and bitter during her 800+ years of life. In that time she had seen everyone around her die, including her children, which brought forth the resolution never to have any more. At the end of that story she had recovered some of her feelings and pledged herself to look after the people that the Doctor left behind. Which is exactly what she was doing when they next crossed paths in the 21st century, looking after and protecting a community of aliens stuck on Earth in Face the Raven. But now she had a secret and her betrayal of the Doctor had the knock-on effect of causing the death of Clara in the process. Their final meeting, in Hell Bent, happened after the Doctor had used Time Lord technology to save Clara. They met at the very end of the universe, as two ancient beings watching the end of everything. Then, after the Doctor’s memory of Clara was erased, Ashildr was seen heading off with Clara aboard a stolen TARDIS, heading for who-knew-where. Throughout this ongoing story, each new encounter with Ashildr showed her slightly changed by the intervening time, more grown as a character and a person. That this worked so well is down to Maisie Williams as an actress, investing each meeting with a step up in maturity until you could almost believe that these tales had been filmed quite some time apart, rather than in reasonably close proximity, time-wise. Such range in a young actress is hard to find and impressive to see played out on screen. There were other significant guest performances throughout the series. The opening two-parter, The Magician’s Apprentice and The Witch’s Familiar, saw a number of returning friends and enemies, including Michelle Gomez as Missy (the female incarnation of the Master), Jemma Redgrave as Kate Lethbridge-Stewart (who would return again later in the series), Julian Bleach’s Davros, and his Daleks. Clara and Missy take on the Daleks (pointy stick not shown). Again we get a delightfully dangerous and batty, in equal measure, tour-de-force from Michelle as Missy. She puts a great amount of energy into her portrayal and just when you think you know what to expect from the character, she turns things on a sixpence and that makes for an entertaining unpredictability. It was especially fascinating this time to see her paired with Jenna’s Clara for the majority of the two episodes. Their relationship added a certain spark to the storyline, giving it a neat counterpoint to the Doctor/Davros scenes of the second episode. Speaking of which, much kudos should be given to Julian Bleach for providing us with an understated and universe-weary Davros, not the ranting maniac from the past but a man worn down by time and expectation from his ‘children’. That he makes the audience feel sorry for the evil creator of the Daleks is the true power of his amazing performance. 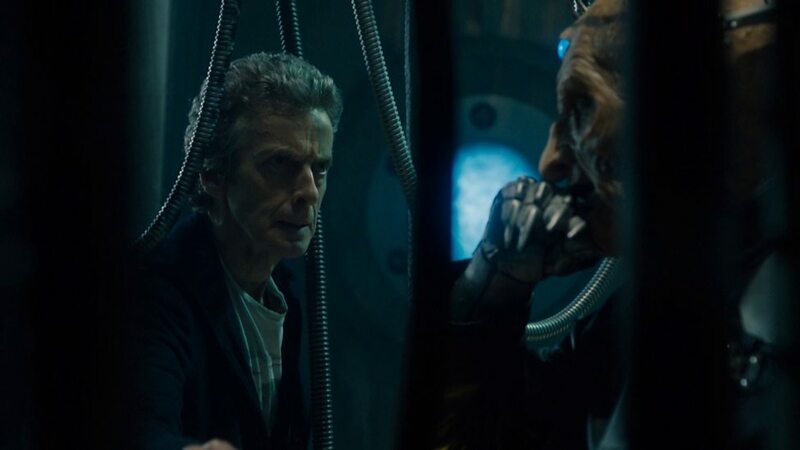 He bounces well off Capaldi’s Doctor in their segments together and gives depth to the character of Davros, a depth that hints that it might be possible for the Doctor to finally have a hand in his redemption. That it was (mostly) a trap for the Doctor adds an extra layer of cunning and manipulation that comes almost as a shock after what has already passed between them. Bravo! The Doctor and Davros. Two old men having a chat. The casting of a deaf actress, Sophie Stone as Cass in Under the Lake/Before the Flood, could be seen as a stunt but it is weaved neatly into the storyline of the episodes in such a way as to make it a significant part of the tale. In the scene where Cass is stalked by the ‘ghost’ of Moran in Before the Flood, it is the vibration of the axe dragging behind him that tips her off to the danger, as she cannot hear the sound of it. Also the fact that Lunn (Zaqi Ismail), Cass’ translator, isn’t allowed into the shuttle and therefore doesn’t receive the message that is central to the story becomes pivotal. Cass is also shown to be a strong leader of the group when she takes over after the death of Moran in the first couple of minutes. 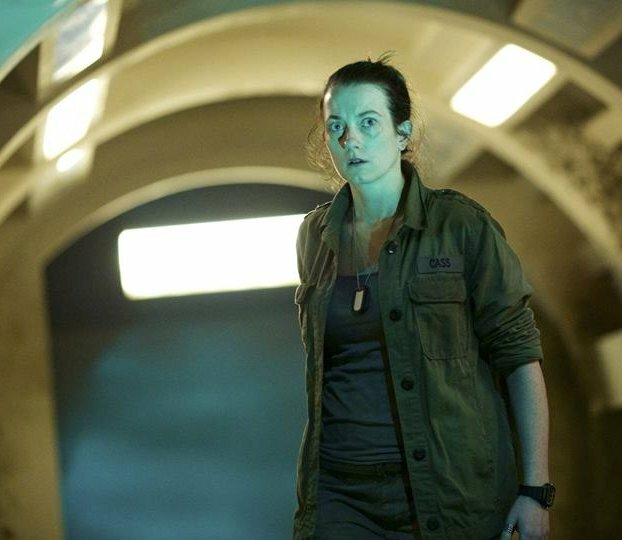 Sophie Stone as Cass, base leader in Under the Lake/Before the Flood. As mentioned above, Jemma Redgrave returns as Kate Lethbridge-Stewart, along with UNIT, for a more substantial part in the story The Zygon Invasion/The Zygon Inversion. This picks up the threads left dangling after the 50th anniversary tale The Day of the Doctor by giving details of the peace deal hammered out between UNIT and the Zygons at the end of that story. Ingrid Oliver also returns as Osgood, despite us having seen her ‘death’ at the hands of Missy in the Series 8 finale, Death in Heaven. This it turns out was one of a pair of Osgoods, one human, one Zygon, who had been established by the Doctor during the negotiations as the guardians of the peace. 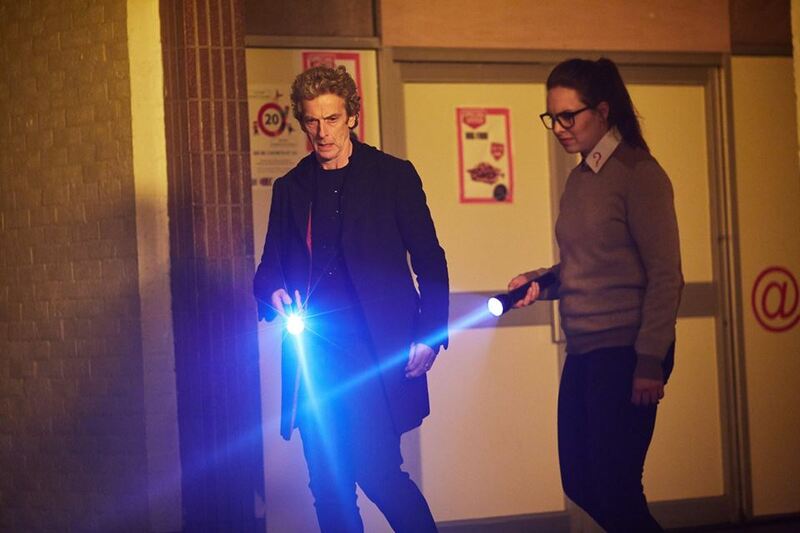 Keeping the uncertainty of whether the Osgood who survived is the human or Zygon is a neat twist and fits neatly into the story concept of it not mattering who belongs to which species, that their actions determine who they are. Both Jemma and Ingrid give their usual superb turns as their respective characters and hopefully we shall see them again in future stories. Basil and Petronella, Science Detectives! The Zygon two-parter also gave Jenna Coleman an opportunity to stretch her acting muscles in an unusual direction as she plays Zygon duplicate Bonnie for most of the story. Bonnie is a cold and precise creature and Jenna gives her a chilling edge through most of the second episode, after she is revealed in the approach to the cliff-hanger. The interactions between Bonnie and Clara are also very well played in their intensity. 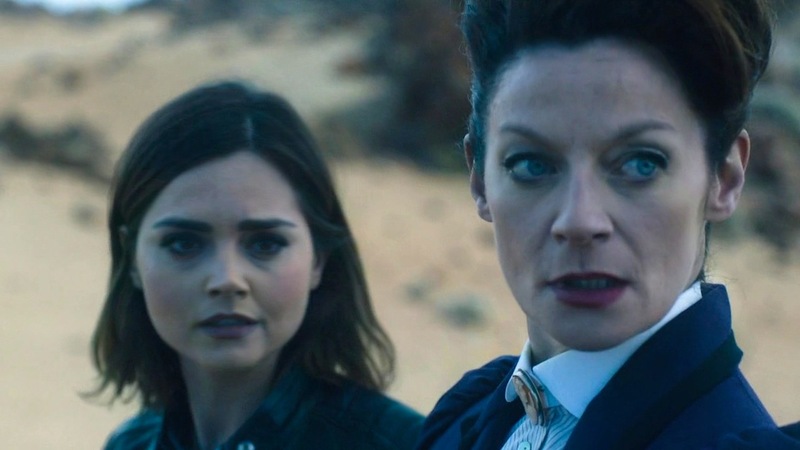 Looking at the writer’s for Series 9 it is a mixture of the experienced (Steven Moffat obviously, Mark Gatiss, Toby Whithouse), more recent conscripts (Peter Harness, Jamie Mathieson) and those completely new to Who (Sarah Dolland, Catherine Tregenna). Of these probably the most impressive is Harness with the Zygon two-parter, after his innovative Series 8 debut episode Kill The Moon. With speculation increasing about Moffat’s replacement when he does decide to step down, Peter Harness must surely be putting his case forward with these much appreciated episodes, with the fans at least. Worthy of mention also are Dolland and Tregenna, the first two female writers employed on Doctor Who by Moffat, both of whom turned in interesting and thoughtful scripts. Those damned fangirls get everywhere! On the whole, despite the drop in the ratings experienced across the whole twelve episodes, Series 9 has been a critical triumph. Even the episodes that might not have been so well received, such as Sleep No More, have been bold and experimental in their telling. Also, some new ideas worked better than others. 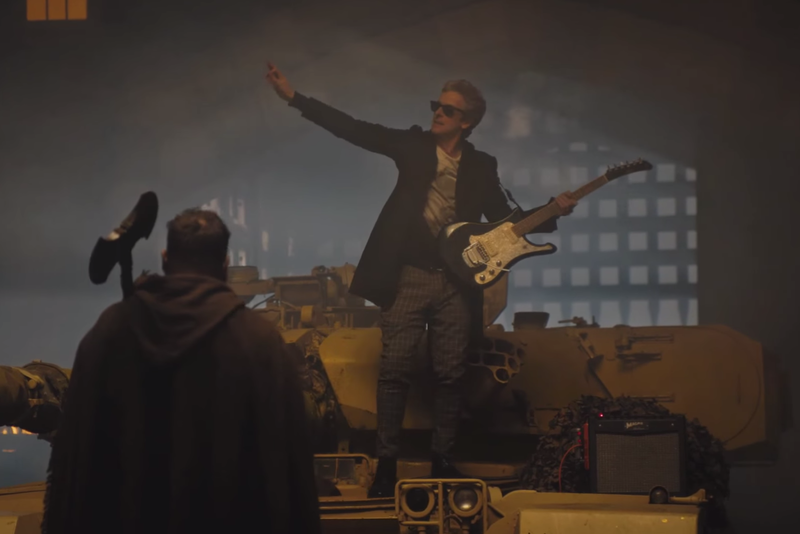 Capaldi looks very natural with an electric guitar, which featured in about half the episodes of the series. Less successful with fans were the sonic shades, which was possibly why right at the end of Hell Bent we got a new sonic screwdriver. But the positives bode well for Series 10, to which both Moffat and Capaldi are committed, though a filming schedule has yet to be confirmed and it appears currently that at least part of it will stretch into 2017. A new companion has also to be announced and that will attract much interest and speculation from the fans and the media. So, the future (and the past and present) look bright for the Doctor Who with a spiky but mellowing 12th Doctor out in the universe. Long may he pilot the TARDIS into new and challenging adventures! 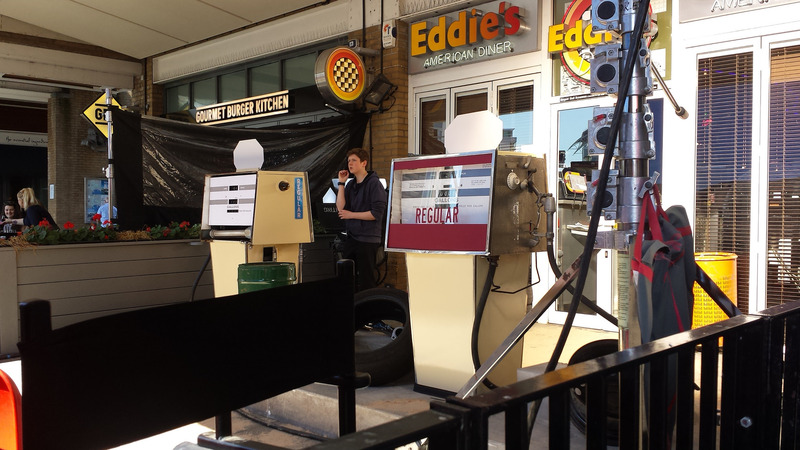 Eddie’s American Diner, complete with ‘gas’ pumps. Not something you see every day in Cardiff. 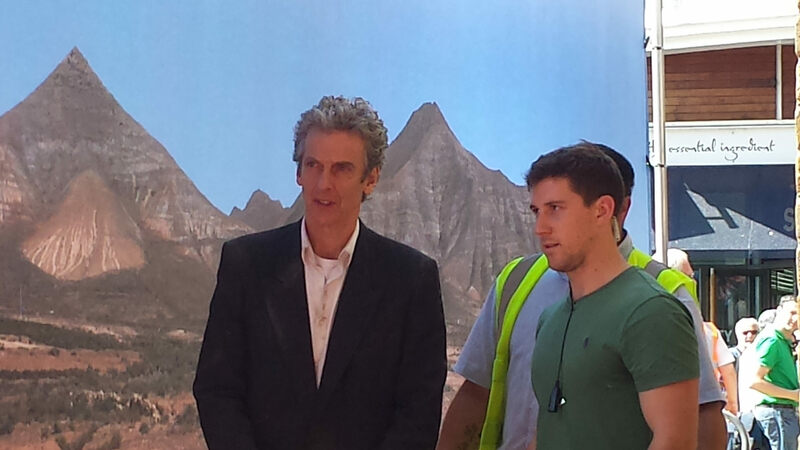 Peter Capaldi with scenery backdrop of mountains and desert. 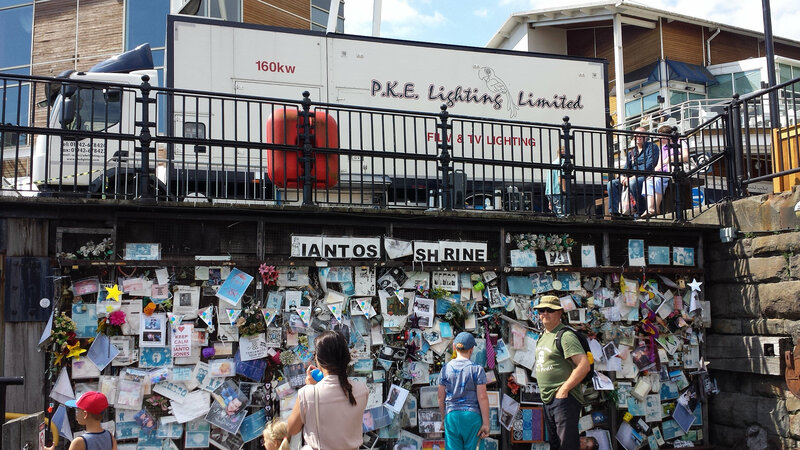 Lighting truck parked above another iconic Cardiff landmark, Ianto’s shrine. Suggestions are that this is filming for the final episode/episodes of the series, though it is also possible that these scenes could fit in anywhere. I guess we will all know by Christmas! The first new trailer for the forthcoming Series 9 has been released by the BBC onto YouTube today. 90 seconds of intriguing glimpses, sounds and quotes (including the one at the top of the page). We also know when the new series will start, September 19th. This puts it four weeks later than last year and if there are no breaks will mean there is just a three week gap between season finale and Christmas episode this year. Featuring old enemies and new aliens, as well as an interesting and mysterious encounter at the very end of the trailer, it can be viewed here…. The next ten weeks cannot come quickly enough! Canadian Doctor Who fans are in for a treat this summer as Fan Expo Canada has just revealed that the three most popular new series companions are ALL going to be at the event taking place in Toronto from September 3-6. Billie Piper, Karen Gillan and Jenna Coleman were just announced as featured guests. Now that they have the most popular recent companions locked up, will they get a Doctor? They have had some over the years including Matt Smith and Colin Baker. Stay tuned to TIMD for more Fan Expo Doctor Who details as they are announced! Over the last couple of weeks, the media circus for the launch of Series Eight of Doctor Who has gathered apace, as August 23rd looms. Such has been the level of coverage, it would be quicker for TIMD to report what’s not been reported, but in brief…..
Peter Capaldi, Jenna Coleman, and Steven Moffat have been jet-setting around the globe on their promotional world tour. 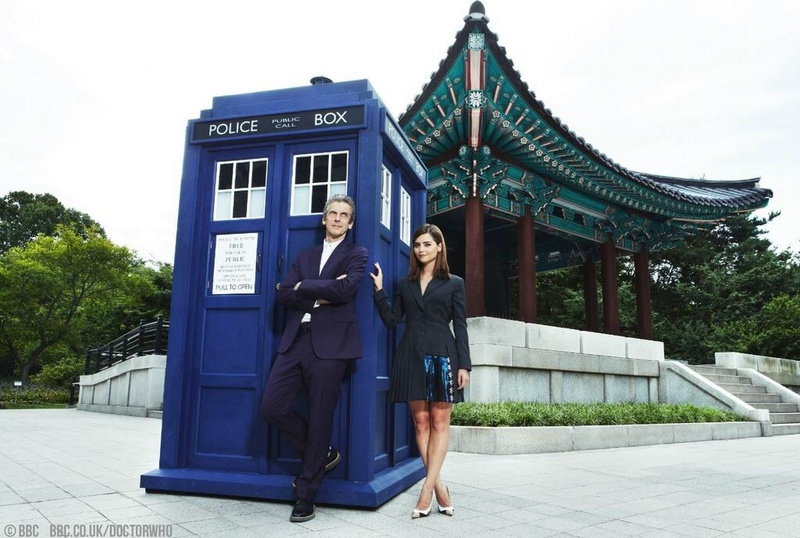 Here’s Peter and Jenna in Seoul. Jenna Coleman is rumoured to be leaving in this year’s Christmas Special. The BBC cannot confirm or deny this, and Jenna herself has been cagey about her future in interviews, stating that she takes it a year at a time. Sound like she’s leaving to you? You decide. Following the leak of the Series Eight premiere, Deep Breath in unfinished workprint form, episodes two and three (Into the Dalek and Robot of Sherwood) then leaked to file sharing sites in the same form in rapid succession in the last week. There is talk on forums that episodes four, five, and six have also now been leaked. We’ve already talked a little about the danger of leaks, after the scripts of the first five episodes recently found their way into the public domain, but, people, just wait. These episodes are unfinished and watermarked. They have unfinished effects, gaps, and they’re in black and white! Much as we abhor a vacuum, Doctor Who starts again on Saturday! Some of TIMD’s friends have seen Deep Breath already at the Cardiff screening. We’re envious, but from what we hear, what’s coming will be well worth the wait. The credits also feature a new arrangement of the theme tune by Murray Gold. Billy will receive a credit for his concept in the new series closing credits. You can see Billy’s original below. The BBC have announced the full titles, plus writing and directing credits for the whole of Series Eight. Interestingly, Steven Moffat has a number of co-writing credits this year, perhaps as a transparency measure by the BBC. So a week before we get to see Capaldi’s debut episode we already know that his companion in leaving at the end of the season. What do you think about the news? Will you be sad that she’s gone? Or are you excited to see who comes next? As July ends and August begins, the publicity campaign for Series Eight continues in earnest, with a variety of interviews and in-depth features published in The Sunday Times, Empire, SFX, and Entertainment Weekly over the last week. Here are some choice cuts from the above, which are all available now. Moffat: “He wanted to be quite stark, stark and skinny. A stick-insect sort of thing. Clara actually calls him a grey-haired stick-insect at one point. We had some hilarious pictures of Peter just dressing up. It was all coming from him because he’s really into his clothes. I didn’t feel qualified to go and chat too much about it. Certainly the costume didn’t go anywhere until I shut up. The thing I’ve learned about showrunning is you need to know the bits you’re bad at! “I’ve got certain things that I’ll say – I don’t want anything in that costume that I have to write into the script. I don’t want people saying ‘But why are you dressed as a circus clown?’ I want him to walk into a pub, a restaurant, a space conference, an army base and nobody stares at him. “There was an issue simply because it’s quite dark as a costume and it’s a show that largely takes place in a tunnel. I kept saying ‘We are going to be able to see him, aren’t we?’ I suppose the red lining helps, when the flaps are open.